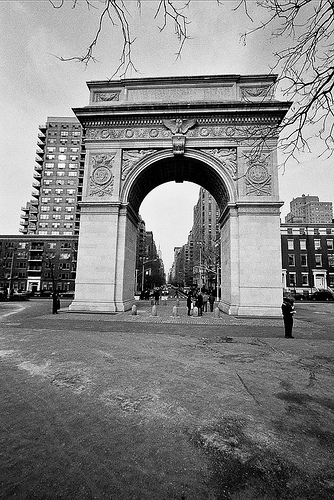 The Washington Square Arch — Is it Leaking (Water)? I write this partly in jest but there was some kind of water issue happening by the door to the Arch on Monday. My delay in posting this is due partly to computer issues (fun!). Above is a photo of the magnificent Arch taken from Fifth Avenue Monday. The photos BELOW show the door to the Arch (the door is on its western side — if you’ve never noticed the door, it is to the right when you are at the front of the structure) leaking water or pooling water. What’s even more unusual is that the last rain was on Saturday, a decent amount, and these photos are from Monday. I wonder if any of this is in relation to that strange structure (in retrospect maybe that was the opening to access the top) that was popping up from the top of the Arch a few weeks back. I questioned the Parks Department about it – even sent them a photo – with no response. I have another thought on that (to be continued…). As I wrote earlier, I’d been in San Francisco. Here are some ‘snapshots’ from yesterday. Most perplexing: what is protruding from the top of the Arch? Interesting. The fence cordoning off Phase III construction has been draped with green plastic sheeting to obscure public view. Was this a decision of the contractor? the Parks Department? This was not the case during Phase II or Phase I. It’s not a terrible idea but it makes me wonder. Also there are no official signs indicating what is being done (as is traditionally the case). A pigeon tried to land on this light and diverted his course and that’s when I noticed..
See Key Posts Column on Right Side Bar to Begin with Part I.